They are beautiful, Well done. Amo le bomboniere, Alice. Sono tanto belle. 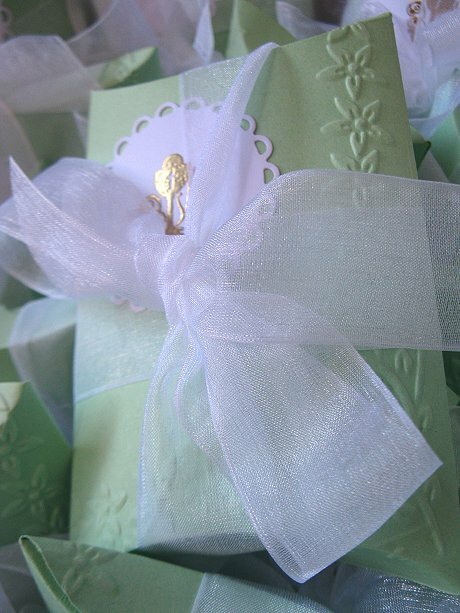 Great embossing and beautiful mint color. Baci, amica. Beautiful pillow boxes Alice. You worked hard!!! Well done in getting them all finished. Love the embossing. Really adds that something special. Have a lovely week. Bella bombonerie, adoro il morbido colore verde e delicati nastri. Mia nuora, mia figlia e io ne abbiamo fatti 180 per il matrimonio, aiutati dalla mia amica italiana Luciana. Li abbiamo fatti in un rosa intenso e con mandorle zuccherine in cui Luciana ha detto che erano tradizionali. Sabato arriviamo in Italia, il tuo bel paese e non possiamo aspettare il bel sole e il cibo delizioso. Mi piacciono u sacco e oltre ad essere eleganti mi piace moltissimo il colore!!!! Hi dear Alice, I am Back from my holidays and catching up with my comments. Veramente belle ed eleganti. Pure embossate in oro , veramente un lavorone, fai bene ad esserne soddisfatta! 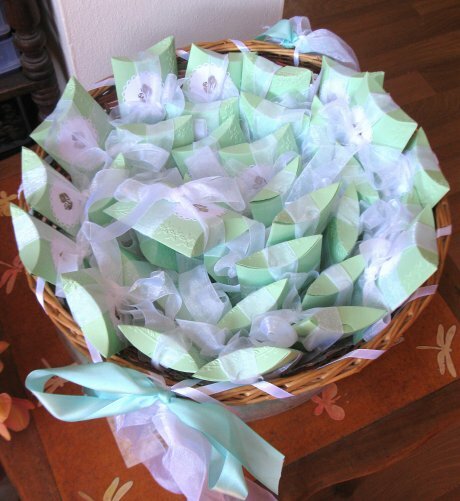 Beautiful and elegant pillowboxes for this occasion,Alice.This took a lot of work. WOW these are fabulous and love the colour and wonderful tulle! Ma che belle queste bomboniere! These are fabulous, the embossed detail is beautiful - so pretty. To make many of the same design, keeping it easy for mass production and giving it a special design, that is a demanding task. You nailed it, they look gorgeous! Wonderful green boxes ! So precious & lovely! Thank you for joining us at Card Mania Challenge ! Wish you good luck! What beautiful and elegant boxes you have made. 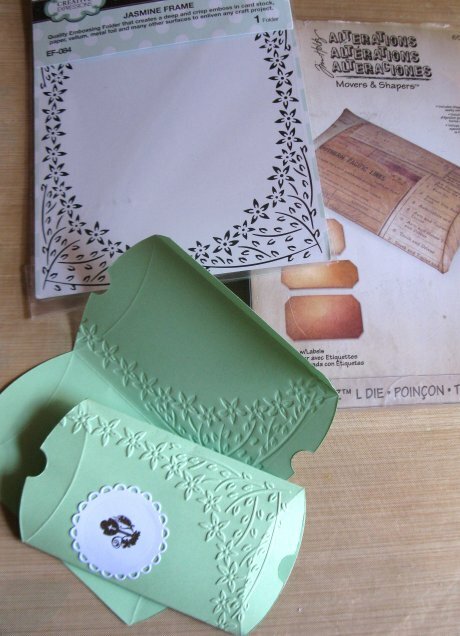 The embossing folder and the heat embossed image are perfect with one another. Hugs Mrs A. How very special. Amazing and the colours are gorgeous. Hello, Alice! I missed this post when I was not blogging and now I get to see how many pillow boxes you made! Wow! That is a lot of work, my friend! I understand what you mean about doing many copies of the same project as it is not as much fun to do, but just look at the result - they are all so beautiful displayed in your lovely basket! I love the pale green colour you chose for the boxes, and the gorgeous embossing and gold stamp makes them look so elegant! I think you used a lot of your beautiful ribbon on these boxes too! I can imagine that the recipients of these communion boxes were very happy to receive such a pretty package! Well done, my friend! So sweet, nice colors, thank you for joining us over at Card Mania Challenge. Love the embossed detail and stamped focal point beautiful! Thanks for playing along with my heARTful stamping challenge this past week. 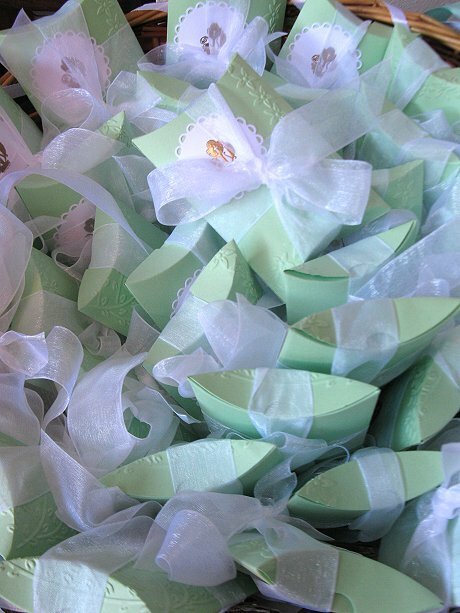 These boxes are very beautiful with the lovely organza ribbon. Lovely work. Thank you for joining the challenge at Not Just Cards and Creative Fingers. Hope to see you again next time.